The water activities around Exmouth for the last week been nothing short of exceptional, with reports of all sorts coming in store of people experiencing some amazing sights while fishing. There’s been copious reports of whales and mantarays in the gulf, along with the incredible interactions with tiger sharks that have been feeding on a whale carcass close to shore. Keen divers got in and swam with some of the sharks, while Birds Eye View got some amazing photos with the micro lights estimating 80-100 tiger sharks feeding in the area around the carcass. We know there’s no shortage of sharks in this region and seeing this clearly justifies our statements. Of course, the tiger sharks are not what anglers would call problematic; it’s the various whaler sharks that are in overwhelming numbers compared with previous years that concern the future of fish in this area. The town is quieter now after the school holidays, but the fishing is continuing to heat up. Large blue marlin are already crashing teasers, along with good numbers of black marlin and striped marlin. The sailfish in the gulf have started to seriously fire up with double figure days being encountered by boats heading out from the marina and Bundegi. Anglers fishing from the shore have had more success in the gulf with queenfish and whiting still high on the catch list. Get in to the surface lures for these fish and you can have some heat-beating sessions as you watch the fish rise to the surface and snavel your lure. The traditional bait method is always good with whiting, but using soft plastics and tiny poppers adds a whole new dimension. The marina has had reports of javelin fish and cod, along with the usual bream. Jacks are starting to be more active as the water heats up. Prawns and squid are the preferred baits, while a half mulie, unweighted also gives a good result. 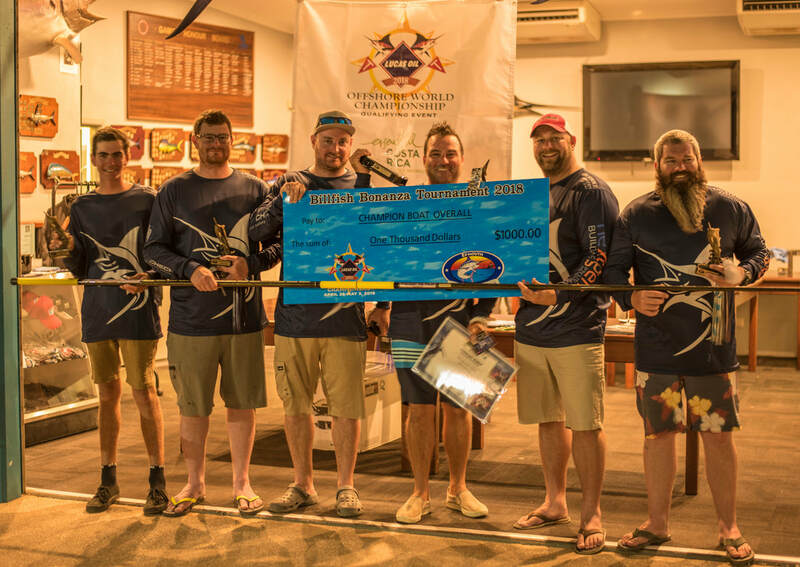 The Exmouth’s Game Fishing Club is holding the annual Billfish Bonanza next weekend, with the major prize being a $2500 accommodation and car hire package from Exmouth Escape. This event is a three day tag and release event for billfish that is awesome for anyone wanting to try billfishing for the first time. If you need a hand, drop in and ask us to help, anyday. Camo shirts for guys and girls. PIC: A happy angler with a tasty red! 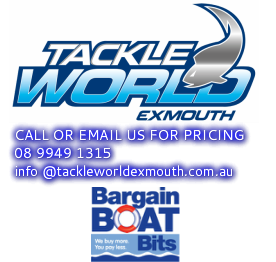 Exmouth is once again turning on the action for red hot captures of billfish as we are only a week out from the 2018 Billfish Bonanza. This week, Halco Boss Ben Patrick brought some high-profile visiting anglers to Exmouth for a week to show them just how good the marlin fishing can be. With the expert skippering of Eddy Lawler from Peak Sportfishing, they managed to tag and release a grand slam of two blue marlin, one black marlin and one striped marlin, all within one session. Other days saw them release blue and black marlin around the 300-350lb mark including a successful capture of two blues from a double header. If that wasn’t enough, on the following day Captain Eddy switched their attention to the Exmouth Gulf to try for some lighter tackle action on the sailfish which are now just beginning to fire up. They managed to release twelve sailfish in a mad afternoon session and left with the fish still biting. Other reports from locals this week included the captures of a bigger than average black marlin as well as some impressive blues. It seems our blue marlin season has got off to a great start and we are hoping for bigger things to come. 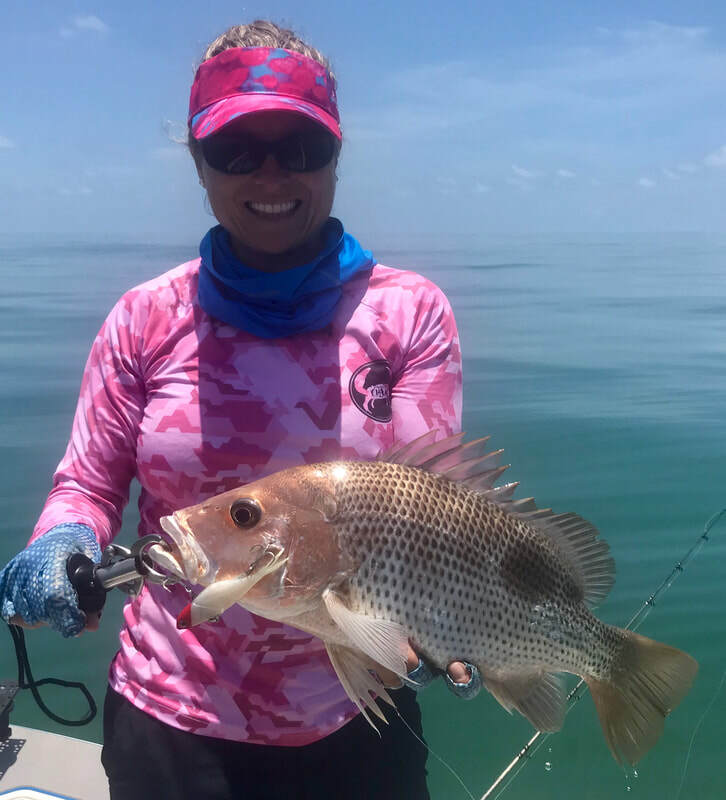 The bait schools in the gulf are vast right now and have been providing a great feeding opportunity for packs of hungry sails, and many anglers have been successful this week in getting shots at big numbers in every session. While the trolling of small to medium sized skirted lures can be a worthwhile prospect, the use of live baits caught with Sabiki bait jigging rods make for the best way to get hooked up to a lively sailfish. Try using in-line circle hooks in sizes 7/0 to 9/0 rigged on a wind on leader of around 150lb to pitch the bait at sailfish which can clearly be seen balling up the baitfish schools. Look for birds hovering and bombing as an indicator as to where the sailfish have pushed the baitfish up toward the surface. The bottom fishing has been nothing short of exceptional with reports of clients aboard Evolution Charters bagging out on tasty red emperor, rankin cod, red throats and various other emperor species. 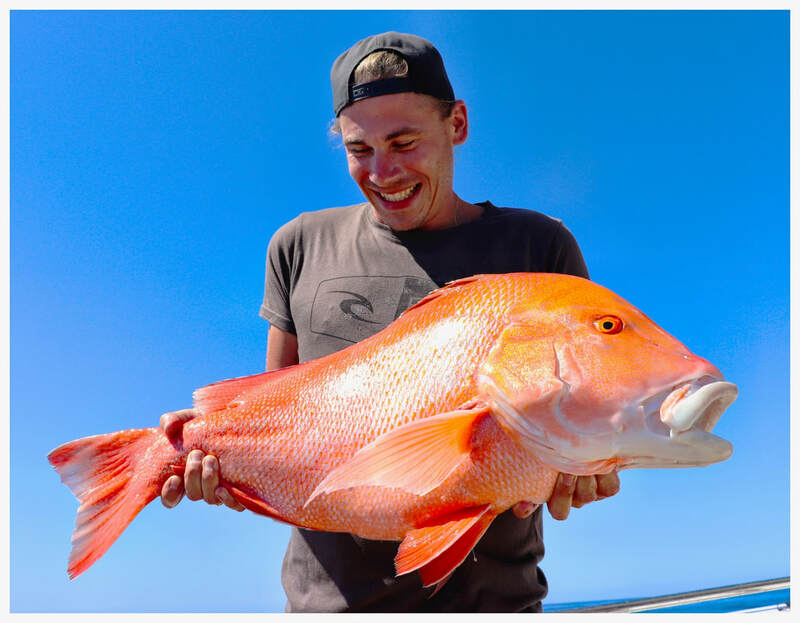 For those who managed to get out wider during the calmer days, gold band and ruby snapper were caught taken beyond the 100m line. Spanish mackerel are also abundant at the Muiron Islands and at the back of the Ningaloo reef. One mackerel was weighed in last week approaching 30kg as well as several other slightly smaller models from the same session. Casting big surface stick baits and poppers into a school of hungry mackerel makes for some of the most exhilarating ways to catch them. Back inshore, good sized whiting are being seen in schools along the beaches of the gulf both north and south of town, and being in such shallow water makes them a perfect target to try your luck at popping for them. Very small and slender poppers twitched across the surface ahead of the schools will usually get them excited enough to slurp the tiny poppers down. A couple of our favourite lures for whiting include the Nomad Dartwing and the Jackson Ebi Panic. The end of the cape provides a bit of protection from gusty southerlies and anglers casting lures there reported good sessions on queenfish and various trevally species. Spangled emperor have also been caught on soft plastics as well as baits on the peak of the tides. The marina is producing plenty of bream, small trevally and the occasional mangrove jack. Hopefully the numbers of Jacks will increase as the water temps are steadily rising. Sabiki Live bait jig rods. PERFECT for King Reef and fresh bait for the sailfish. PIC: Winners of the Billfish Bnanza. Billfish raised:124 Billfish Hooked:110 Billfish Tagged:85, made up of 75 sailfish, 4 black marlin, 3 blue marlin and 3 striped marlin. 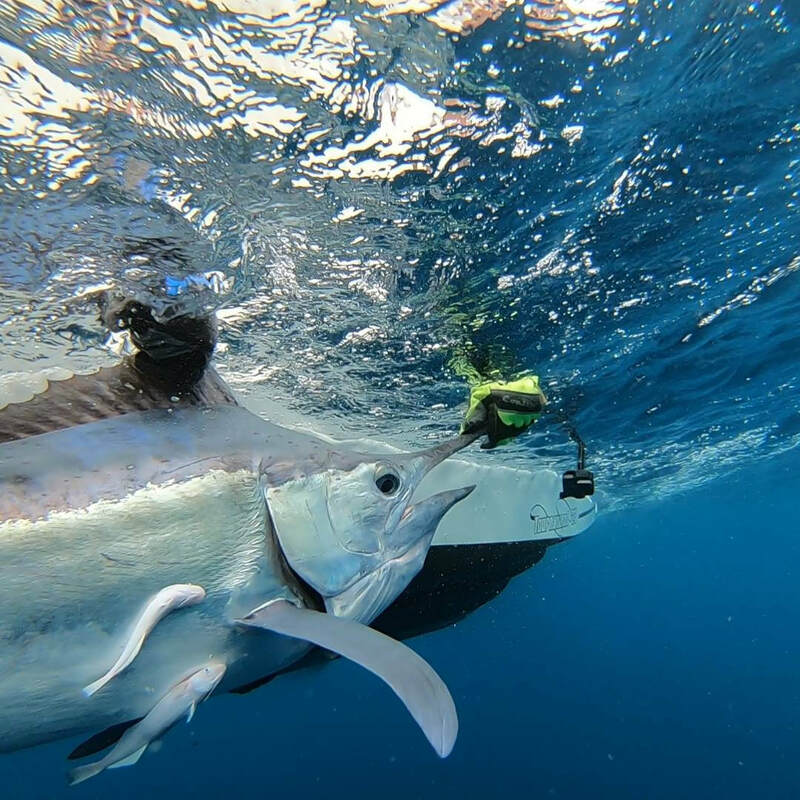 The Billfish Bonanza is a qualifying event for the 2019 Offshore World Championship to be held in Costa Rica. Captain Josh Bruynzeel and his team have said they intend to head over there and compete in late April. There has been some honked whiting along town beach of late, along with the usual bream that feed along the shoreline at high tide. Cruising through at times rather fast are schools of milk fish too. It is a very healthy fishery in the gulf, whether you are out deep or on shore. Prawns are the best bait for the whiting, while small poppers are also a great fun way to catch these tasty fish. 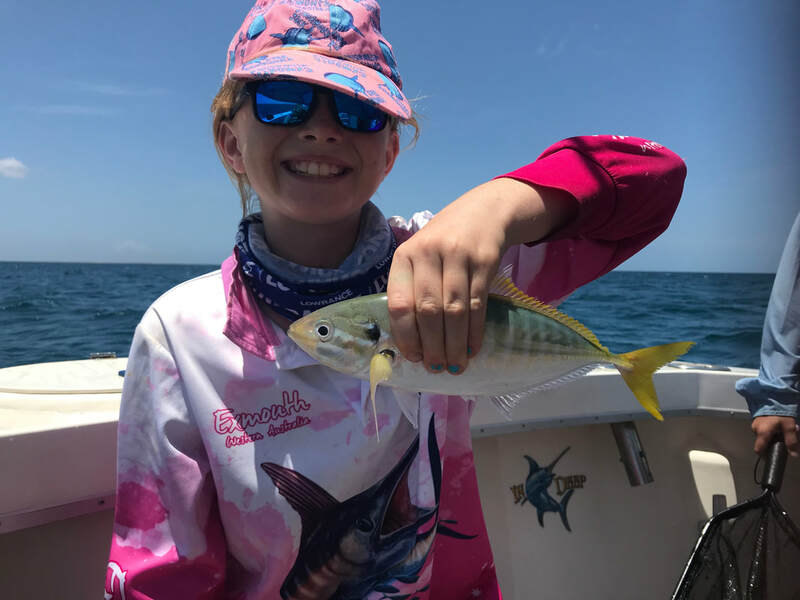 They are also great for kids as they do not have nasty spikes like other fish and are a great start to fishing for any kid off the beach. Large queenfish are usually in patrol at this time of year along the shoreline in the gulf as well and although the weather hasn’t been too kind of late, it is looking better for this coming week. Fly fishing enthusiasts love this time of year when they can wade in the shallows and sight cast to species such as this that periodically swim by in schools. We always recommend using single barbless hooks for these fish on metals, poppers, stick baits or fly. Sensational Tag Poles hand crafted for your best results. A sailfish that was tagged on October 16th by Scott Owens was re captured by Eddy Lawler on October 31st. Many anglers tag and release fish and to get recaptures is always exciting, as it is a rather large ocean out there?! It also shows how a fish can be hooked, landed, handled, released and survives to then continue feeding and returns to be caught again. The very interesting part about this recapture was the fact that Scott had left the hook in the mouth of the fish. Eddy retrieved the hook and within two weeks you could clearly see how it was breaking down to fall out. 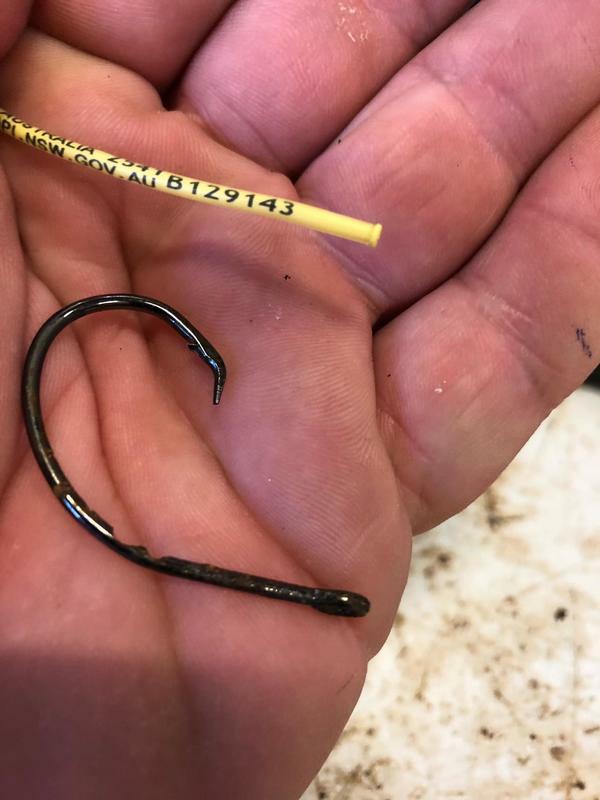 Obviously, the hook in the mouth and interaction from tagging had no effect on the fish continuing to hunt and it has been re-tagged and released. The blue marlin, striped marlin and black marlin are showing up in bigger numbers each day. This is bringing anglers from various areas, particularly overseas to charter vessels. There has been by-catch of yellowfin tuna and mahi mahi by the crews targeting billfish, which is not too bad either. The big yellowfin start to show up in larger numbers in January, but we are happy to see them early this year. Despite November and the heat of summer increasing, the fishing can be awesome in Exmouth through this time in town where it is quiet in other tourism related activities. The best part is the lack of people using the boat ramps or on the beaches, so get out and enjoy people! VLF bay has had a stack of mack tuna feeding on small minnows. Large queenfish have been amongst the schools of bait and the odd shark mackerel. Lures of choice are definitely the stick baits and metal slices. Retrieve these fast across the surface, or cast far and let it drop a few meters to then retrieve fast. You should get in to the action, or if that fails you can troll various lures in this area to pick up any one of the larger predatory fish that often patrol this part of the coast. If shore fishing is your only option, take a medium spin outfit and walk the tip of the cape with the wind at your back. The mornings have had some strong south easterlies blowing, while the afternoon has had the south westerlies kicking in. Dawn or dusk are great and not too cold at this time of year, but make sure you have some good rock boots on and a backpack with all you need. You can at times get a few mozzies in this area, so be prepared if the wind is light. Use poppers, stick baits, metals and soft plastics for best results and remember that if you get a crackin pic, to send it in to us at the shop and you could be in the paper! Christmas is going to be here before you know it? 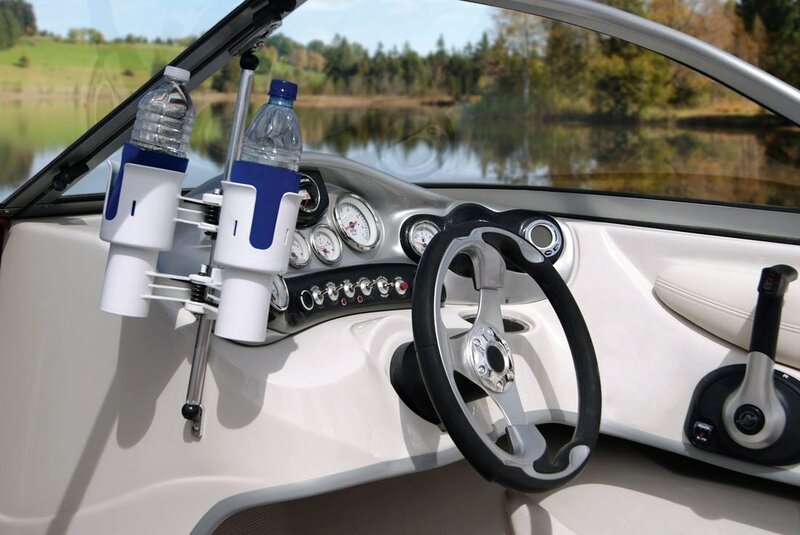 There are so many new ideas and products in fishing, camping and boating. If you want some inspiration for a present, drop in store and ask us any day. We are open every day of the year (except Christmas Day!) from 7am-6pm. Perfect for the boat! Great Christmas gift. There is a hot body of water hanging north of the Muiron Islands that the local bluewater crew are watching closely to see when it will reach the Exmouth fishing grounds. The crews are hoping it will bring some extra action, particularly in the lead up to the full moon. Traditionally this moon phase and month is great for the big blue marlin and we are hoping it will show some sensational results again. Of course, it is then all dependent on the wind factor, which hasn’t been too friendly of late. The gulf has continued to fire with multiple sightings of sailfish being reported each day. Foreign visitors have been getting in amongst the action with it all. The billfishing scene is active twelve months of the year here and there is no doubt that the fishery is world-class, so it is good to see people from around the globe visiting our remote town for this style of fishing. The live bait in the gulf has been insane this last month or two, with loads of schools and big sized scad. They make great baits for billfish and other predatory species. The shore based action at Learmonth of an early morning has been exciting, particularly when it has been glass as the sun rises. While this can be pleasant on the eye with a gorgeous view, throwing poppers or stickbaits can get your adrenaline flowing as fish come up to smash them on the surface. You can expect queenfish, emperor, cod and various trevally species to hit these lures in this area. Of course, I would never visit Learmonth Jetty without a squid jig in my tackle box, so make sure you have one handy for when they cruise past. 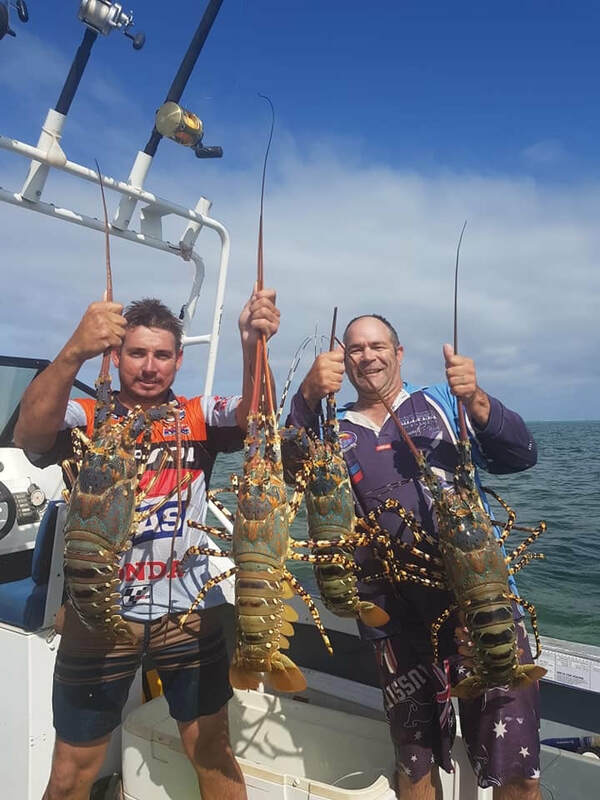 Reports of tasty red rock lobster and extra-large ornate rock lobster have been coming in store this week as people hit the water with the warmer temperatures. We do not recommend attempting to target these without a decent pair of dive gloves and loop. Especially the larger ornate variety that you can barely get your hand around. If you have never targeted these before, check out the different patterns on the legs to help you identify which type of rock lobster it is prior to looping. Are you getting ready for the festive season? We are so lucky in Exmouth to have such a great variety of fresh seafood on offer. Whether it is fish, prawns, crabs, lobster or calamari, we have a delicious selection and we recommend getting your plans together now for that great luncheon date. Thanks Jeff Nelson for the lobster pic and Jorja Mossman for the big scad pic! 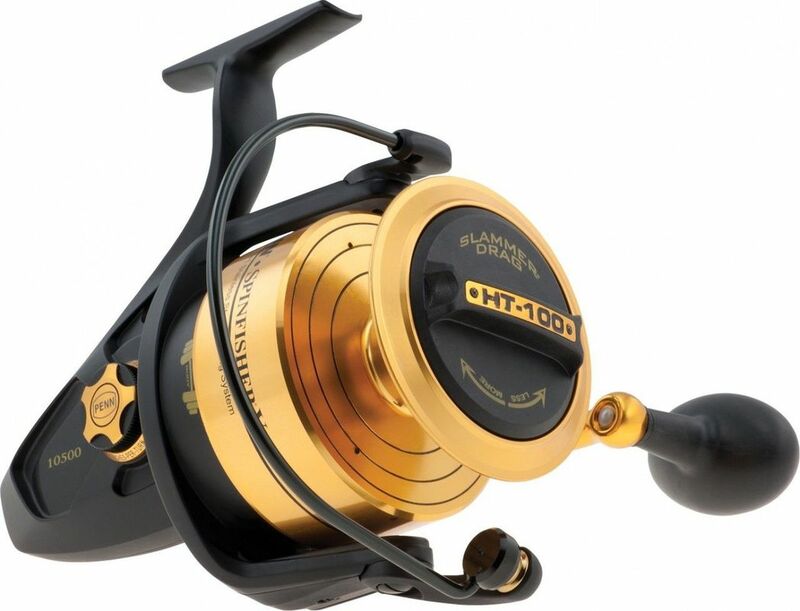 Penn Spinfisher Reels and combos. LOADS in stock ready for Christmas.